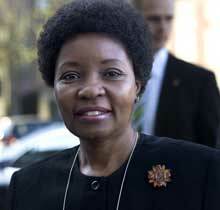 Asha-Rose Mtengeti Migiro, on January 5, 2007, was named as the Deputy Secretary-General of the United Nations. She was formally appointed and assumed office on February 5. She is married to Cleophas Migiro, and the couple has two daughters. Migiro commenced her education at Mnazi Mmoja Primary School in 1963. She later moved on to Korogwe Primary School, Weruweru Secondary School, and, finally, Korogwe Secondary School, where she graduated high school in 1975. She obtained her LL.B and LL.M from the University of Dar es Salaam and her Ph.D. in 1992 from the University of Konstanz in Germany. Before entering politics, she was a senior lecturer at the Faculty of Law at the University of Dar es Salaam. Migiro served as a ward member of Chama Cha Mapinduzi from 1994 to 2000, and as a member of a Regional Executive Council from 2000 to 2005. From 2000 to 2006, she was the Minister of Community Development, Gender and Children's Affairs. She became the Minister for Foreign Affairs and International Cooperation on January 4, 2006, when the previous foreign minister, Jakaya Kikwete, who had been elected president, appointed his new cabinet. While in the position of foreign minister, Migiro accompanied the former president of the Comoros, Azali Assoumani, as he toured his country's new consulate in Tanzania and inspected a Tanzanian hospital. According to United States officials, Condoleezza Rice, the American Secretary of State, is "personally acquainted" with her. Kikwete appointed Bernard Membe to succeed Migiro as foreign minister. Migiro was appointed to the post of United Nations Deputy Secretary-General by Ban Ki-moon, the new United Nations Secretary-General from South Korea, on January 5, 2007. According to Ban, "She is a highly respected leader who has championed the cause of developing countries over the years..." He also said that "Through her distinguished service in diverse areas, she has displayed outstanding management skills with wide experience and expertise in socio-economic affairs and development issues."